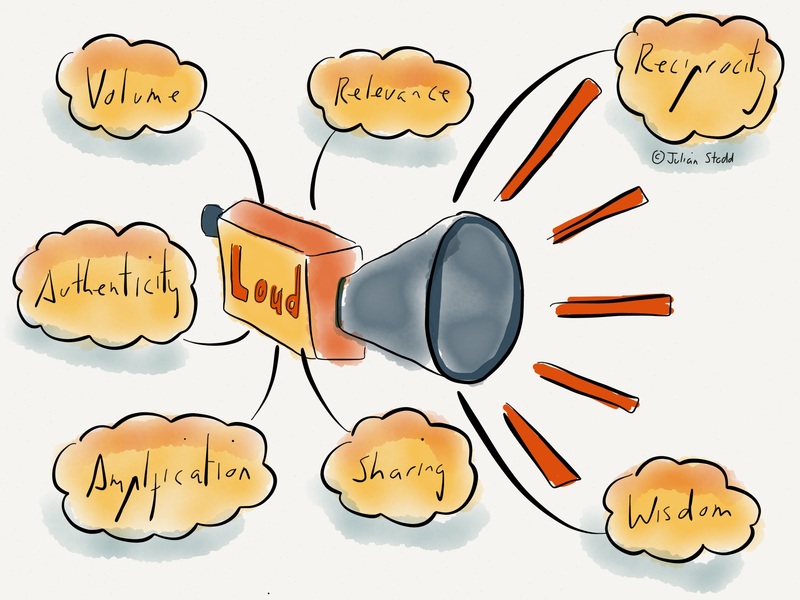 There a nuance about communication in the Social Age: less about volume, more about relevance and spread. Or rather, less about how loudly you can shout, more about who you talk to quietly with great authenticity. In Social Leadership, i’ve been exploring authority through permission of the community: socially moderated, socially granted. Contextual and consensual. Right at the start of the model, we talk about ‘sharing’, sharing widely but wisely. It’s this notion that you don’t have to shout loudest to get heard: you have to talk to the right people with the right story for them at the right time. Volume alone won’t cut through the noise, because everything about our environment today adapts us to ignoring noise. Relevance is what counts, combined with authenticity: how much you believe in the stories that you share. What’s your first reaction when you see a photograph on Facebook showing something improbable? If you’re like me, you assume it’s faked until convinced otherwise. Authenticity has to be earned as a function of reputation: share lots of fake photos and nobody will believe what’s real. It’s the same with stories in organisations: share lots of stuff you don’t believe in and nobody will be able to see the real you. It’s about sharing wisely, with no expectation of immediate reciprocity: share with people because it’s timely and relevant. For them. Not for you. Offer help and support without a price-tag. You can try to effect change through volume, but doing it with authenticity is easier. This entry was posted in Change and tagged Agility, Amplification, Authenticity, Communication, Social Age, Social Leadership, Volume. Bookmark the permalink.